The Florentines venerated the Biblical David as a protector of the city, so it should come as no surprise that Donatello chose this subject for one of the most expensive sculptures created up until that time (the famed and wealthy Medici family commissioned the work). 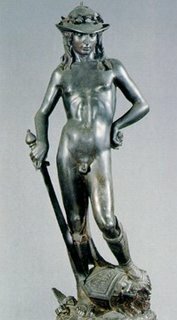 The careful lines and contraposto stance, as well as the lost wax method used to create it, show the strong influence of the works of antiquity. Nonetheless the statue continues to defy interpretation, given the seemingly random choices that Donatello made in composing the figure.